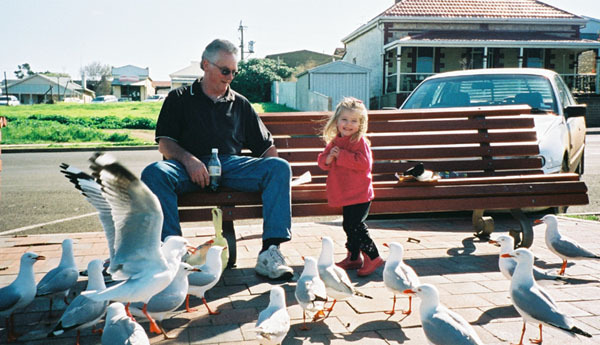 What is so special about food from Kangaroo Island? Maybe it's because of the Island's unique location. Travelling due west, the next stop is Argentina - South America! Surrounded by sea, the Island enjoys a temperate climate under the influence of maritime breezes. With limited industry, the Island remains a "clean-green" environment, untainted by the large scale development of more urban areas. Many enterprising and far sighted Islanders have turned to alternative primary production from the traditional Kangaroo Island industries of wool, cereal cropping and fishing. The diverse and increasing range of produce, appeals to the most discerning food enthusiast. Among the collection of delights are the free-range poultry products. With a fox-free Island, the poultry is able to roam free ensuring big, meaty birds and true free range eggs. The reputation of free range, corn fed, Island poultry has seen recipes featured in the Australian Gourmet Traveller, and sees it featured on the menus of quality restaurants throughout Australia. Naturally fresh seafood features prominently on the menus of the Island's many eating establishments. King George Whiting is one of the most popular and frequently requested dishes. Marron - a fresh water crayfish, is another speciality that has gained many fans. Simple to cook and serve, it has a fine taste and texture that appeals to all lovers of shell fish. Other products made with great care and thought are the delicious jams, jellies, sauces and pickles. Many of these are made with local wild ingredients. Visitors staying at some of the smaller accommodation houses are often treated to locally made strawberry jam or, perhaps, native apple or currant jelly. Clifford's Honey Farm is 5.5 km south of Kingscote on Hundred Line Road. The unusual name for this road comes from the fact that it precisely follows the boundary between the Hundreds of MacGillivray and Haines, part of the formal land division. This explains the lack of corners on this section of road! The Honey Farm is a 600 hectare (1500 acre) sheep property operated by the Clifford family. The dramatic drop in wool price lead to the establishment of the Honey Farm in 1993. The Clifford's had always kept a few hives of the relatively gentle Ligurian bees but production has stepped up with the development of the honey farm to the point where over 10,000 kilograms of honey is produced annually. Ligurian bee exists. The Clifford's offer free honey tastings of at least 3 varieties of honey plus the opportunity to purchase honey, locally made souvenirs and Jenny's famous honey ice cream! The tour of the honey room explains bee communication and social organisation, the process of honey production by the bees, collection and extraction by bee-keepers, and development of a range of other by-products. Before the 1880's there were no honeybees on Kangaroo Island. When importations were made between 1881 and 1885, the intention was for them to breed up and provide a future source of purebred queen bees for the beekeeping industry. These bees oiginated from Liguria in Italy and so are known as Ligurian Bees. In 1885 the South Australian Government proclaimed Kangaroo Island to be a bee sancturary for these bees and no more importations would be permitted. So today, we believe that Kangaroo Island is the only place in the world where pure strains of the Ligurian bee can be found, as the island is out of range of bee flight from the mainland. The Ligurian bee is renowned for being a gentle strain of bee and can produce an excellent range of honey flavours, high in quality and quantity. Honey from Kangaroo Island is produced from many varieties of native eucalyptus, Tea trees, Bottlebrush and bansia trees as well as introduced trees, shrubs and plants like canola. The different flavours of honey are acheived by moving the hives into areas as different species come into bloom. Honey can be harvested at approximately 3 week intervals and hives are moved every 6 to 8 weeks. 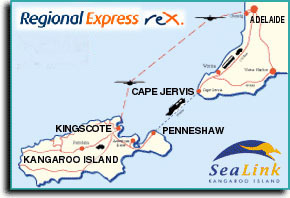 Visitors can easily reach Kangaroo Island by sea or air. A short 30 minute flight from Adelaide brings visitors to Kingscote Airport. The airport is located 13 km from Kingscote. Transport is available, but arrangements should be made at the time of booking. Ferries operate from Cape Jervis on the mainland to Penneshaw. Coach connections are available between Adelaide and Cape Jervis, and Penneshaw and Kingscote. Bookings are required for ferry and coach connections. QantasLink will offer flights to Kangaroo Island Airport from both Adelaide and Melbourne from December 2017. Flights from Adelaide will commence on 4th December 2017, operating three times per week year-round, and increasing to five times per week over the peak summer season through to Easter. Seasonal flights from Melbourne will commence on 17th December 2017, operating three times per week during the peak summer holiday season through to the end of January. For further information and bookings, please visitÂ www.qantas.comÂ or phoneÂ 13 13 13. Kangaroo Island SeaLink operates two large, luxurious vehicle and passenger ferries, between Cape Jervis (approx. 2 hour drive from Adelaide on the Fleurieu Peninsula) and Penneshaw KI. There are four departures daily, with additional services during peak times. Bookings are necessary. Travelling time is a comfortable 45 minutes. Mainland coach connections are available to/from Adelaide and Goolwa to Cape Jervis. Island connections are available to/from Penneshaw to American River and Kingscote. You can bring your vehicle from the mainland by KI Sealink ferry or you can hire a vehicle from Kingscote, Penneshaw or the Airport. Four wheel drive vehicles are not necessary - with care, you can enjoy all the Island has to offer in a car. There are a range of options available to tour the Island with some-one else doing the driving. Coach tours are available, or alternatively more personalised 4WD tours can be arranged. Most tours will pick-up from your accommodation or the airport. For those with determination and energy, biking or hiking can be considered, but this should not be considered lightly. The island is large (155 km long) and careful assessment of your fitness level and equipment should be made. There are nearly 1600 km of roads on the Island. The major roads between Penneshaw, American River, Kingscote and Parndana are sealed, as is the road to Seal Bay and Vivonne Bay. Work is in progress to upgrade the roads to the western end of the Island. Many of the roads are unsealed, and require reduced speed and caution - particularly on corners, and when approaching other traffic. These roads are constructed of ironstone, which is a loose floating material that tends to build up on corners, requiring more moderate steering and braking. Just because the roads appear empty, do not stop in the middle of the road, especially around a bend, there is someone coming behind you. If you start out with a full tank, there should be no need to obtain more fuel for your journey, but it is a good idea to obtain fuel whenever possible if you are spending some time on the Island. Fuel is available from Kingscote, American River, Island Beach, Penneshaw, Parndana, Vivonne Bay and Tandanya. LPG is available at Kingscote, Penneshaw and Parndana. People drive at different speeds - based on their ability, safety comfort zone or desire to see the Island at a relaxed pace. Please give consideration to other road users - keep left and allow faster moving traffic through. Our wildlife is precious, protected, and active at night! Native animals are blinded by bright light. Slow down, dip your lights, and take the time to observe the wildlife. There is no public transport system or taxi service on the Island, but shuttle services are available from the airport and Penneshaw ferry terminal to Kingscote. Contact transport operators for details.